A man has died in a stabbing on a north London street, police have said. 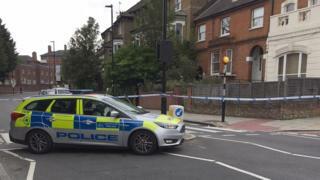 The victim, 25, was found wounded after police were called to Corinne Road, Tufnell Park, at about 21:30 BST on Tuesday. He was given first aid by officers and paramedics from London Ambulance Service but died at the scene, the Metropolitan Police said. A murder investigation has been launched and a post-mortem examination will be held in due course. Police said extra officers will be in the area as local CCTV footage is recovered and forensic analysis continues. There have been no arrests. The scene remains cordoned off.